GRACE: What Christians Believe about it. All God's dealings with mankind at the present time are on the basis of grace. This means that He shows men favor which they do not deserve. The word grace is found over 160 times in the Bible. Of these occurrences, 128 are in the New Testament. God is spoken of as "the God of all grace." I Peter 5:10. Christ is described as being "full of grace." John 1:14. The Holy Spirit is called "the Spirit of grace." Hebrews 10:29. Thus the three persons of the Godhead are closely linked with grace. The word used in the Old Testament carries the meaning-"to bend or stoop in kindness to an inferior." The New Testament word means "favor, goodwill, lovingkindness." 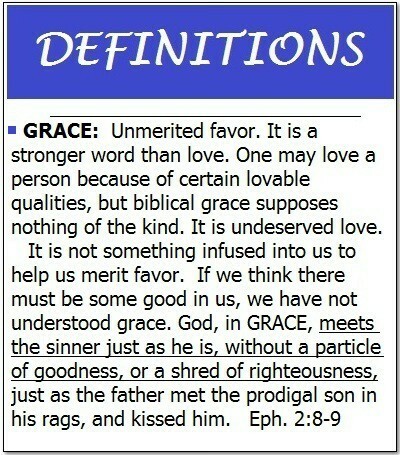 The following definitions have proved helpful in explaining what grace is. "Grace is love displayed to unworthy objects. God is love; but when He bestows that love on guilty, unclean, rebellious sinners, then it is grace." "Love that looks up is adoration. Love on its own level is affection. Love that descends is grace." "Grace is God showing nothing but love and mercy when we deserved nothing but wrath and judgment. It is God bending toward us in infinite love." "Grace is seen in God giving heaven's Best to save earth's worst." Grace is not to be confused with works. If man could obtain salvation by doing good works, then salvation would simply be his wages. Romans 4:4-5. Romans 11:6. God does not owe anything to man. Salvation is a free gift. Grace is not to be confused with law. Men are not saved by keeping the law. They are saved by grace. The following will help to make this clear. Law brings a work to do. Grace tells of a work that is done. Law says, "This do and thou shalt live." Grace says, "Live, and thou shalt do." Law says, "Thou shalt love the Lord thy God." Grace says, "God so loved the world," John 3:16, and "We love Him because He first loved us." I John 4:19. Law condemns the best. Romans 3:19. Grace saves the worst. Romans 3:24; 4:5. Law reveals sin. Romans 3:20. Grace reveals salvation. Titus 2:11,13. Man is a sinful rebel against God's holy law (Romans 3:23; Colossians 1:21). Therefore, he deserves nothing but God's judgment. Man stands guilty before the bar of God, having broken God's holy law. (Romans 3:19; Galatians 3:10; James 2:10.) As such, he is subject to the curse of God. If man is to be saved, it must be by God's grace. But God is holy and He cannot overlook sin. Sin must be punished. The Gospel tells us how God can save sinners by grace, and still be holy in doing so. Christ suffered the wrath and judgment of God against sin. On the basis of the work of Christ, God can forgive the sins of those who trust the Lord Jesus. Christ has finished the work. Grace only demands faith on the part of the sinner who seeks salvation. Ephesians 2:8, 9. Salvation. Titus 2:11,13. This means that a Christian has eternal life. Justification. Romans 3:24-26. This means that God reckons [or, considers] a sinner who has believed on Christ as being blameless. Standing before God. Romans 5:2. This means that a true believer can enter into God's presence by prayer. He is no longer separated from God by his sins.